Lateral ankle sprain injury is the most common musculoskeletal injury incurred by individuals who participate in sports and recreational physical activities. Following initial injury, a high proportion of individuals develop long-term injury-associated symptoms and chronic ankle instability. The development of chronic ankle instability is consequent on the interaction of mechanical and sensorimotor insufficiencies/impairments that manifest following acute lateral ankle sprain injury. To reduce the propensity for developing chronic ankle instability, clinical assessments should evaluate whether patients in the acute phase following lateral ankle sprain injury exhibit any mechanical and/or sensorimotor impairments. This modified Delphi study was undertaken under the auspices of the executive committee of the International Ankle Consortium. The primary aim was to develop recommendations, based on expert (n=14) consensus, for structured clinical assessment of acute lateral ankle sprain injuries. After two modified Delphi rounds, consensus was achieved on the clinical assessment of acute lateral ankle sprain injuries. Consensus was reached on a minimum standard clinical diagnostic assessment. Key components of this clinical diagnostic assessment include: establishing the mechanism of injury, as well as the assessment of ankle joint bones and ligaments. Through consensus, the expert panel also developed the International Ankle Consortium Rehabilitation-Oriented ASsessmenT (ROAST). The International Ankle Consortium ROAST will help clinicians identify mechanical and/or sensorimotor impairments that are associated with chronic ankle instability. This consensus statement from the International Ankle Consortium aims to be a key resource for clinicians who regularly assess individuals with acute lateral ankle sprain injuries. Lateral ankle sprain injuries associate with high societal economic costs, related to injury diagnosis, initial management, rehabilitation and reduced work productivity. In the UK, Cooke et al 6 reported an average of 6.9 days of paid work lost due to lateral ankle sprain injuries, adding at least an additional £805 in lost productivity costs for each injury to the overall costs, compared with £135 of direct healthcare costs. The combination of high incidence and both direct and indirect costs makes the economic burden of lateral ankle sprain injuries indisputable. The interaction of mechanical and sensorimotor impairments that manifest following acute lateral ankle sprain injury contribute to the development of chronic ankle instability.16 Therefore, clinical assessments should evaluate whether a patient in the acute phase following lateral ankle sprain injury exhibits any mechanical and/or sensorimotor impairments. However, previous research has documented that clinicians may have a limited understanding of the full spectrum of mechanical and sensorimotor impairments that manifest following an acute lateral ankle sprain injury.17 Hence, the treatment being administered following acute lateral ankle sprain injury is unlikely to be based on objectively identified mechanical and sensorimotor impairments. 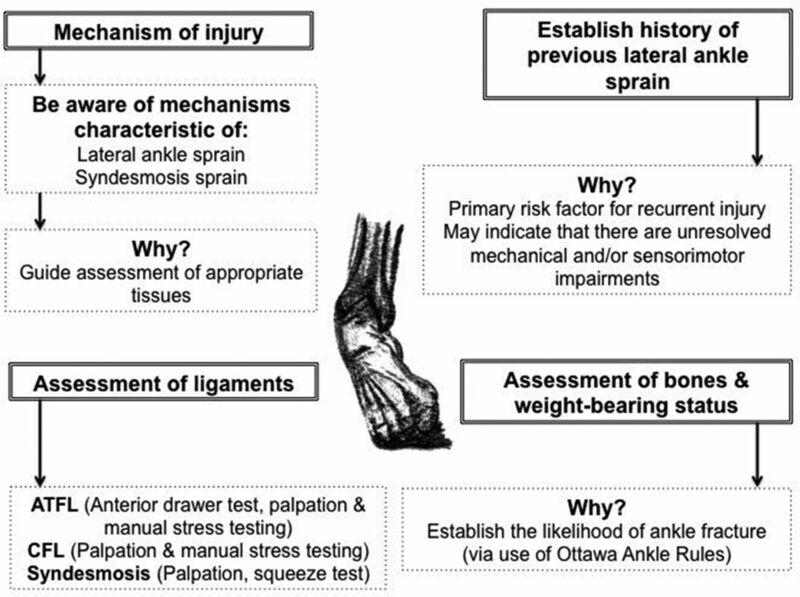 As such, it is necessary to develop recommendations for structured clinical assessment following acute lateral ankle sprain injury, which addresses both mechanical and sensorimotor impairments. Considering this, the aim of this project was to develop, based on expert consensus, recommendations for structured clinical assessment of acute lateral ankle sprain injuries. These recommendations should have a particular emphasis on impairments that are known to associate with chronic ankle instability. This modified (consisting of two rounds) Delphi study was undertaken under the auspices of the executive committee of the International Ankle Consortium. The International Ankle Consortium, which was inaugurated in 2004, is an international community of researchers and clinicians whose primary academic purpose is to promote scholarship and dissemination of research-informed knowledge related to ankle sprain injury and chronic ankle instability. A previous consensus statement of the International Ankle Consortium2 and its supporting evidence document1 were used as the starting point for this modified Delphi study. The protocol for the present modified Delphi study, which details the study methodology, has been published.18 In summary, our modified Delphi process started with an anonymous online questionnaire (round 1) specifically related to the clinical assessment of acute lateral ankle sprain injuries. The online questionnaire consisted of a number of distinct sections including: (1) participant demographics; (2) subjective assessment and patient-reported outcome measures; (3) diagnostic imaging; (4) objective assessment (including asssessment of bony integrity, ligamentous integrity, range of motion, arthrokinematics, strength, neurodynamics and postural balance); and (5) performance assessment. An email was sent to all members of the executive committee of the International Ankle Consortium requesting their participation in the online questionnaire. Participants were required to complete the online questionnaire within 4 weeks of receiving the invitation email. A reminder email was sent to all participants 2 weeks after the initial invitation email. Regarding the online questionnaire, participants were requested to respond to questions related to the importance of different constructs of the clinical assessment of acute lateral ankle sprain injuries on a scale of 1–5 (1=strongly disagree; 2=disagree; 3=no opinion; 4=agree; and 5=strongly agree). They also had the opportunity to elaborate further on how they would assess certain structures or functions by providing expanded answers to open-ended questions. The responses to the online questionnaire were collated, analysed (completed August 2017) and used as the foundation for a subsequent consensus meeting of the executive committee of the International Ankle Consortium (ie, international multidisciplinary expert group). This consensus meeting (held on 14 September 2017) represented round 2 of this modified Delphi method. Data from round 1 were automatically extracted from the online questionnaire to a Google Sheets document. For questions with a Likert scale response, frequency tables were automatically generated, and the level of agreement was calculated for each response. To establish the level of agreement, the total percentage of ‘strongly agree’ (5 on the Likert scale) and ‘agree’ (4 on the Likert scale) responses was calculated. Consensus agreement was defined as ≥75%, partial agreement was defined as 50%–75% agreement, while no agreement was defined as <50%. Qualitative data (ie, open-ended responses to questions as part of the online questionnaire) and responses that reached partial agreement were used as discussion points in round 2 of the modified Delphi process. After two consecutive modified Delphi rounds, performed between May 2017 and September 2017, full consensus was achieved on the clinical assessment of acute lateral ankle sprain injuries (figure 1 and table 1). Clinical diagnostic assessment. ATFL, anterior talofibular ligament; CFL, calcaneofibular ligament. Fourteen experts from the executive committee of the International Ankle Consortium were invited to participate, all of who agreed. The expert panel (males=84.6%, females=15.4%; age=45±6.2 years) were employed in a number of countries including Australia, Ireland, the Netherlands, Switzerland, USA and the UK. All expert panel members had authored or coauthored numerous peer-reviewed articles on the topics of lateral ankle sprain and chronic ankle instability, as well as having contributed to previous consensus statements. The years of clinical experience varied (15.7±13.5 years) across the members. The expert panel members assessed an average of 40 patients a year with lateral ankle sprain injuries and/or chronic ankle instability. The expert panel members identified their expertise in the clinical assessment of patients with acute lateral ankle sprain injuries and/or chronic ankle instability as an average of 8 out of 10, with 10 being the highest level of expertise. All experts (100%) participated in round 1; however, answers for one participant were excluded due to technical issues. Thirteen participants successfully completed round 1. Expert consensus (≥75% agreement) was reached on 37 of the 62 questions included in the online questionnaire. Fifteen criteria reached partial agreement (50%–75%) and hence were brought forward for discussion in round 2. Online supplementary file table 1 details the level of agreement for each of the questions in the online questionnaire. Ten of the 14 expert panel members were able to attend the executive committee meeting of the International Ankle Consortium, which functioned as round 2 of the modified Delphi process. This meeting took place the day before the 7th International Ankle Symposium (14 September 2017). Results from round 1, which reached ≥75% agreement, were automatically included in this consensus. Results from round 1 that reached partial agreement (50%–75%) along with responses to open-ended questions (part of the online questionnaire) were discussed further among the 10 experts who were present at round 2. To establish the level of agreement in round 2, the total percentage of ‘strongly agree’ (5 on the Likert scale) and ‘agree’ (4 on the Likert scale) responses was calculated. Consensus agreement was defined as ≥75%. Final consensus was reached in round 2 and is presented in figure 1 and table 1. This modified Delphi study involving experts from the executive committee of the International Ankle Consortium reached consensus on recommendations for clinical assessment of acute lateral ankle sprain injuries. With regard to injury diagnosis, there were five important considerations, which the expert panel reached consensus on. These are as follows: (1) mechanism of injury; (2) history of previous lateral ankle sprain; (3) weight-bearing status; (4) clinical assessment of bones; and (5) clinical assessment of ligaments. Hence, the experts agreed that these should be clustered into a clinical diagnostic assessment. Regarding the evaluation of mechanical and sensorimotor impairments, there were 10 important considerations, which the expert panel reached consensus on. These are as follows: (1) pain; (2) swelling; (3) range of motion; (4) arthrokinematics; (5) muscle strength; (6) static postural balance; (7) dynamic postural balance; (8) gait; (9) physical activity level; and (10) patient-reported outcome measures. Hence, the experts agreed that these should be clustered and termed the International Ankle Consortium Rehabilitation-Oriented ASsessmenT (ROAST). We advocate that clinicians should consult these recommendations as they detail an imperative first step towards the development of an appropriate management pathway for this prevalent injury. The expert panel agreed on a pragmatic minimum standard clinical diagnostic assessment, which does not require specialist equipment (eg, diagnostic imaging) and can be applied across a range of clinical settings. Establishing the mechanism of injury is advocated as it can give clinicians an indication of what anatomical structures are likely to have incurred insult, and hence what tissues should be prioritised during clinical assessment. Numerous published articles have described the kinematics of lateral ankle sprain injury occurrences.19–24 Clinicians should suspect injury to the lateral ligaments of the ankle joint if the patient reports that the mechanism of injury involved a sudden rapid inversion and internal rotation loading of the foot and ankle complex, irrespective of sagittal plane angular displacement. The mechanisms of injury associated with ankle syndesmosis ligament injuries are less clear but have been reported to include external rotation of the foot, eversion of the talus within the ankle mortise and excessive dorsiflexion.25 Therefore, clinicians should suspect injury to the syndesmosis ligaments if the patient describes/recalls any of the aforementioned injury mechanisms (ie, external rotation of the foot and hyperdorsiflexion). Establishing history of previous lateral ankle sprain injury or ankle joint injury is endorsed primarily for two reasons. First, it has been established that previous lateral ankle sprain injury heightens the risk of injury recurrence.26 27Second, if the presenting patient has previously sustained a lateral ankle sprain injury, it is probable that injury-associated mechanical and sensorimotor impairments are present, which should be addressed as part of a comprehensive rehabilitation programme. The Ottawa Ankle Rules28 should be used to determine the likelihood of ankle joint fracture. If a patient reports pain in the ‘malleolar zone’ and if this is accompanied by pain on palpation of the distal 6 cm of the posterior edge of the medial malleolus, or pain on palpation of the distal 6 cm of the posterior edge of the lateral malleolus, or an inability to weight-bear four steps immediately after injury and on clinical presentation, then an ankle joint X-ray is warranted (online supplementary appendix I). The Ottawa Ankle Rules have been reported to have higher sensitivity than specificity, meaning that they are better at ruling out the possibility of ankle joint fracture, rather than making a diagnosis of ankle joint fracture.29 Following an inversion and internal rotation injury of the ankle joint, the pretest probability of ankle joint fracture is less than 15%.30 If the Ottawa Ankle Rules are implemented in such instances but findings are negative (ie, none of the rules are positive; negative likelihood ratio=0.02), the post-test probability of ankle joint fracture is less than 1%. The clinical assessment of the integrity of the lateral ligaments of the ankle joint, as well as the ankle joint syndesmosis ligaments is advocated. The main lateral ligamentous stabilisers of the ankle joint are: the anterior talofibular ligament, the calcaneofibular ligament and the posterior talofibular ligament. The anterior talofibular ligament is the most commonly injured of these ligaments.31 It originates at the anterior margin of the lateral malleolus, and it runs anteromedially to insert on the talar body immediately anterior to the joint surface occupied by the lateral malleolus.32 Replication of the patient’s ‘known pain’ on palpation and/or stressing (ie, passive plantar flexion and inversion) of the anterior talofibular ligament is indicative of injury to this ligament (online supplementary appendix I). Clinical stability tests to assess for complete disruption of the anterior talofibular ligament are best performed between 4 days and 6 days after injury.33 The anterior drawer test is the most sensitive clinical stability test to assess for complete rupture of the anterior talofibular ligament.33 The sensitivity and specificity of this test are 0.96 and 0.84, respectively, with an associated negative likelihood ratio of 0.04.33 This means that if there is no ‘sulcus sign’ on testing the integrity of the anterior talofibular ligament using the anterior drawer test, then there is low probability that it is completely disrupted/ruptured (online supplementary appendix I). The calcaneofibular ligament originates from the anterior part of the lateral malleolus and courses obliquely downwards and backwards to attach to the posterior region of the lateral calcaneal surface.32 It is superficially crossed by the peroneal tendons and sheaths, with only approximately 1 cm of the ligament being uncovered and directly palpable. Replication of the patient’s ‘known pain’ on palpation and/or stressing (ie, passive dorsiflexion of the ankle joint combined with passive inversion of the rearfoot) of the calcaneofibular ligament is indicative of injury to this ligament (online supplementary appendix I). The prevalence of ankle joint syndesmosis ligament injury (with or without concomitant lateral ligament involvement) has been reported to be 20%.31 As such, it is important to undertake a clinical assessment of the ankle joint syndesmosis ligaments. Sman and colleagues34 have reported that localised tenderness on palpation of the syndesmosis ligaments is the most sensitive clinical assessment test (sensitivity=0.92), while the squeeze test is the most specific clinical assessment test (specificity=0.88). Thus, if the most sensitive clinical assessment test (palpation of the syndesmosis ligaments) and the most specific clinical assessment test (squeeze test) are positive, there is a high probability of injury to the syndesmosis ligaments (online supplementary appendix I). The expert panel agreed on a rehabilitation-oriented assessment, with the primary purpose of identifying the presence of mechanical and/or sensorimotor impairments that are known to contribute to the development of chronic ankle instability. To determine the true presence of these impairments in the acute phase following injury clinicians can potentially use the non-injured side as a comparator. Assessment of talocrural joint arthrokinematics is advocated. It has been proposed that impairments in ankle joint dorsiflexion range of motion are likely related to a disruption in talocrural arthrokinematics.16 This is supported by studies that have reported either restrictions in posterior talar glide,47 48 or the existence of an anterior positional fault of the talus within the talocrural joint.49 50 The posterior talar glide test as reported by Denegar et al 48 can be used to assess posterior glide of the talus within the talocrural joint. Assessing static postural balance is endorsed as an integral component of a rehabilitation-oriented clinical assessment following acute lateral ankle sprain injury. Deficiencies in static postural balance have been consistently identified in individuals with chronic ankle instability.55 Both the Balance Error Scoring System56 and the Foot Lift Test57 are clinically applicable methods for assessing static postural balance performance (online supplementary appendix I). High-quality prospective research is needed to determine whether these recommendations for clinical assessment of acute lateral ankle sprain injuries can optimise the management of individuals who have incurred this injury. The executive committee of the International Ankle Consortium reached consensus on recommendations for structured clinical assessment of acute lateral ankle sprain injuries. Recommendations are provided on an initial diagnostic clinical assessment. The International Ankle Consortium ROAST is also presented, which places emphasis on the assessment of mechanical and sensorimotor impairments that are known to associate with chronic ankle instability.
. Development of the Foot and Ankle Disability Index (FADI). J Orthop Sports Phys Ther 1999;29:A32–A33. Contributors All authors have made substantial contributions to this manuscript. They have all participated in the concept and design, analysis and interpretation of data and drafting and revising the manuscript. All authors have read the manuscript and agreed to submission for publication. Ethics approval University College Dublin Human Research Ethics Committee.